People in the southeastern U.S. are facing life threatening winds and rains from Hurricane Florence. Less obvious, but also of great concern, is the public health threat posed by a variety of contaminated sites located around the region. These include giant pits filled with coal ash, a byproduct of burning coal that contains toxic chemicals like arsenic and lead; lagoons swirling with hog manure from factory farms; hazardous waste dumps known as Superfund sites; and industrial facilities stocked with thousands of pounds of toxic chemicals. Many pollution-filled pits in the region are not as hardened against the potential for storms and other emergencies as the public would expect. Coal ash is a case in point. 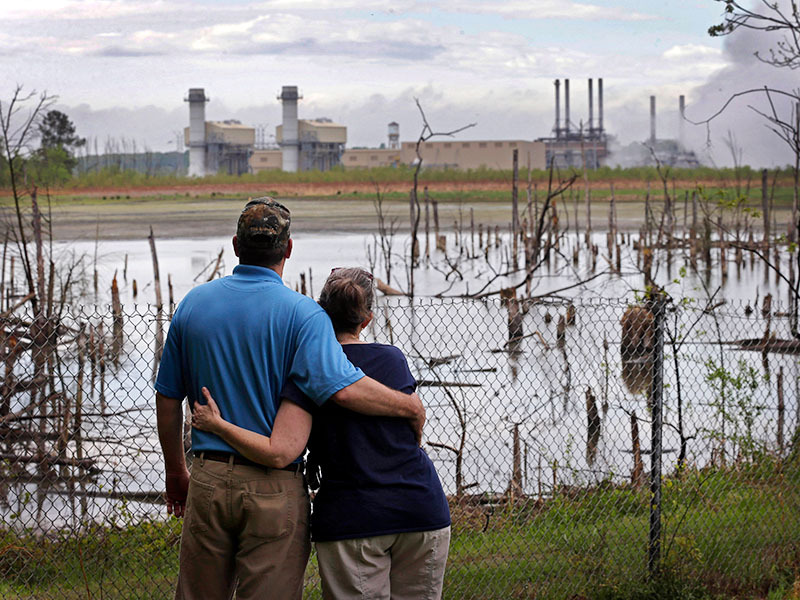 But coal ash sites can leak or fail altogether in even milder circumstances. 3.74 inches. That’s how much rain Duke Energy claimed it took to cause a coal ash spill in October 2017 at one of its sites near the city of Gaffney, South Carolina. And the infamous TVA spill in 2008, which released more than a billion gallons of coal ash and destroyed the Tennessee community, occurred in the middle of the night on what was otherwise a normal December day. But the situation gets even more dangerous for people living near coal ash sites when hurricanes blow into town. 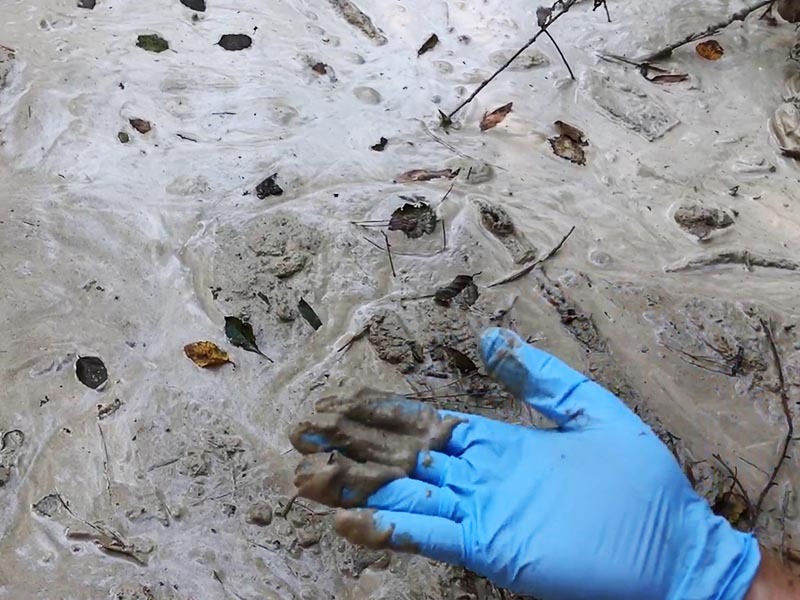 During Hurricane Matthew in 2016, violent winds and rain caused coal ash from another Duke Energy site to wash into the Neuse River in North Carolina, coating trees, the water, and the riverbank with a milky-white substance up to an inch thick. Florence is on track to be much more severe than Matthew. As of Friday, it’s dumped up to 18 inches of rain, and it could end up dropping up to a total of 10 trillion gallons of rain on North Carolina alone. “What happened with Hurricane Matthew was relatively minor in terms of what could happen this year with Florence,” says Earthjustice attorney and coal ash expert Lisa Evans. The safety around coal ash sites and other waste pits is lacking because it suits industry to deal with this toxic waste the cheapest way it knows how: by mixing water with the ash to create a slurry and then dumping millions of tons of this slurry into giant pits. Another cheap trick is to put these pits next to rivers so that the coal plant doesn’t have to travel far to water down its waste. Though this practice is great for the industry’s bottom line, it’s a disaster waiting to happen for communities unfortunate enough to live next to these waste sites. Our thoughts are with those who have been harmed by Hurricane Florence, including those who have lost their homes and loved ones. We call on the federal government and states affected by the storm to utilize all available resources to help people reach safety, recover, and move forward. Part of rebuilding must include enacting stronger regulations on hazardous sites like coal ash ponds to keep communities safe. It’s the government’s responsibility to force polluting industries to secure and clean up their messes. And as climate change continues to increase the strength and frequency of hurricanes, it’s also the government’s responsibility to enact regulations that will slow climate change and address its impacts. For far too long, communities across the country, and particularly communities of color and low-income communities, have had to live in the shadows of toxic sites created by industries allowed to put profits over people. We need to ensure the safety of our fellow citizens both when the storms blow and when the seas are calm. Coastal communities already have enough to deal with when a hurricane comes their way.